As many anglers become more and more eco-conscious (an undoubtedly good thing), in an era when we know felt-soled wading boots can contribute to the spread of aquatic invasive species that ruin rivers (things like mudsnails, didymo etc. ), a lot of fly fishers are choosing their boots carefully. 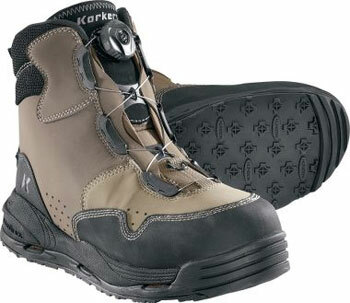 The Korkers Metalhead wading boot won to “Eco-Friendly” award honors at the International Fly Tackle Dealers show recently, because the boots’ interchangeable outsoles can be treated, switched, frozen, or dried in a way that helps protect the waters. Let’s be clear: No product is, purely by design, a cure-all to the threats posed by aquatic invasive species, but if you have a choice to wash your boots, and then pop off the soles and freeze them overnight (versus freezing your boots entirely), eco-friendly fishing becomes a heckuva lot easier. The boots themselves are hydrophobic, meaning they absorb less and dry faster (and shrink less when they do dry). And the forthcoming “Svelte 2” sole material offers a reliable alternative to felt. Metalheads also are easy to slip on and off. MSRP: $159.99–$179.99. Find a Korkers dealer near you. More mentions of Korkers on MidCurrent.